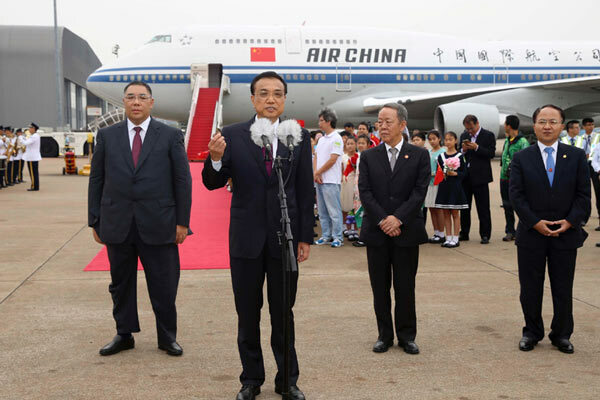 Premier Li arrived in the Macao Special Administrative Region (SAR) for a three-day inspection visit. He will meet with Macao SAR Chief Executive Chui Sai On and be briefed by other Macao officials. The premier will also attend the opening of the fifth Ministerial Conference of the Forum for Economic and Trade Cooperation between China and Portuguese-speaking countries. He will deliver a keynote speech and hold meetings with state leaders attending the conference. The fifth Ministerial Conference of the Forum for Economic and Trade Cooperation between China and Portuguese-speaking countries has been held in the Macao Special Administrative Region. Premier Li Keqiang continues his first inspection visit to the Macao Special Administrative Region. Li urged Macao to seize the opportunity of building on the Belt and Road initiative when he toured the region on Tuesday. China will offer aid and preferential loans worth 4 billion yuan (around $600 million) to Portuguese-speaking countries in Africa and Asia in the next three years. The fifth Ministerial Conference of the Forum for Economic and Trade Cooperation between China and Portuguese-speaking countries is being held in Macao on Tuesday and Wednesday. Chinese Premier Li Keqiang, who is attending the event, stressed Macao's role in connecting China with the world's Portuguese-speaking nations. Premier Li Keqiang visited Macao’s historical sites and then enjoyed traditional local delicacies in the afternoon on Oct 11. China and the Portuguese-speaking countries have seen their ties upgraded in a variety of ways during the past decade. Premier Li said that China's economy did better than expected in the third quarter. Li acknowledged that corporate debt levels are high but said the situation is under control. Premier Li said that China's economy did better than expected in the third quarter. Li acknowledged that corporate debt levels are high but said the situation is under control. Macao has always acted as a bridge between China and Portuguese-speaking countries since the mid-16th Century. Now as China takes cooperation with Latin American countriesto a higher level, the former Portuguese colony is expected to undertake a bigger role. Premier Li Keqiang delivered a keynote speech at the opening ceremony of the 5th Ministerial Conference of the Forum for Economic and Trade Cooperation between China and Portuguese-speaking countries (PSCs) on Oct 11 in Macao. Despite a positive outlook from Portugal's Prime Minister, many Portuguese companies are struggling back home. CCTV's reporter looks at how some of these companies are starting to fix their focus on the Chinese market. Chinese Premier Li Keqiang has arrived in Macao for an inspection tour, his first of the Special Administrative Region. He met with its chief executive, Chui Sai On and praised the government's practice of the 'One country, Two systems' principle. During the tour of Macao, Li also plans to attend the opening of the fifth Ministerial Conference of the Forum for Economic and Trade Cooperation between China and Portuguese-speaking countries. On Monday, Li Keqiang met with the leaders of several African countries who will attend the event. Macau recently put out its first five-year plan to develop the special administrative region. Premier Li Keqiang continued his inspection in Macao on Tuesday, urging Macao to seize development opportunities and improve people's lives for a better future. Chinese Premier Li Keqiang said here Tuesday China is willing to build more substantial economic and trade ties and develop long-term stable and sound partnership with Portuguese-speaking countries (PSCs). China's economy is better than expected so far this year, Chinese Premier Li Keqiang said here Tuesday, citing the increase of new jobs and contribution of consumption and service industry to overall economic growth. The Fifth Ministerial Conference of the Forum for Economic and Trade Co-operation between China and Portuguese-speaking Countries began here Tuesday. Chinese Premier Li Keqiang arrived in the Macao Special Administrative Region (SAR) on Monday for a three-day inspection visit. For some discussion, we have in the studio Professor Liu Chunsheng from Central University of Finance and Economics. Welcome Professor Liu. Let's discuss the forum with Professor Liu Chunsheng from Central University of Finance and Economics in the studio. CCTV's Wang Tongxuan sat down with Portugal's ambassador to China to talk about the Prime Minister's trip and the future of their bilateral relations.